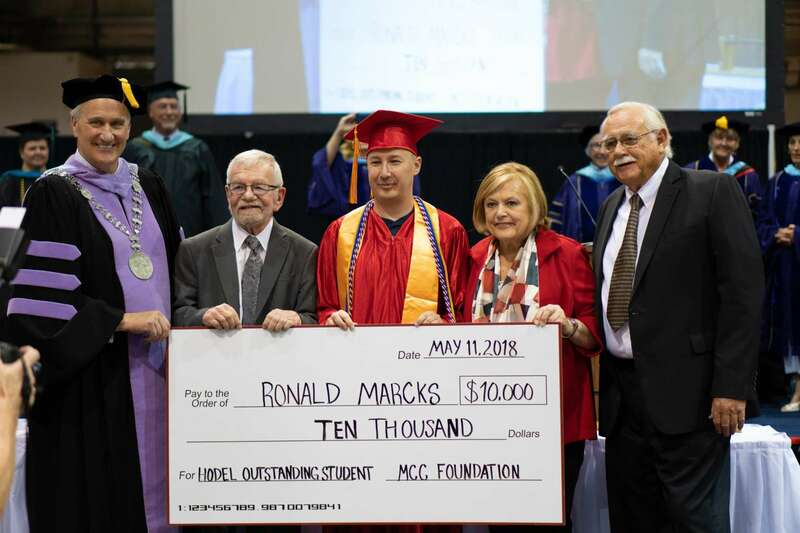 When Ronald Marcks graduated from Mohave Community College with an associate degree in liberal arts, he also received a check for $10,000. He is the college’s the first annual Kathy Hodel Most Outstanding Student Award recipient. 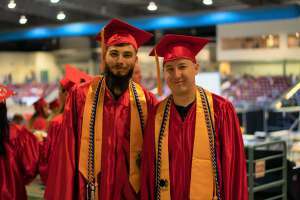 Reyes Lerma (left) and Ronald Marcks at the MCC 2018 Graduation. During the award presentation, MCC President Dr. Michael Kearns said Marcks far exceeded all the award requirements, which included a minimum of 30 hours of service to the community. 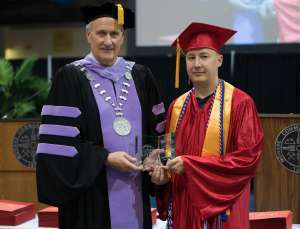 “Ronald Marcks also received glowing reviews from faculty, staff and community members who worked with him,” said Dr. Kearns, who read to the graduation audience of several thousand people, part of a recommendation letter from Susan Chan, executive director of Kingman Academy of Learning. 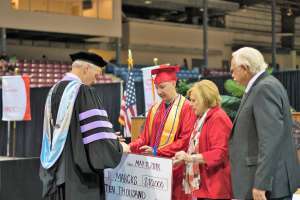 Money for the annual award comes from a $200,000 endowment set up by Dr. James Childe, a retired attorney and former MCC business instructor. Dr. Childe created the Kathy Hodel Most Outstanding Student award to help honor outstanding MCC students and Kathy Hodel for all of her work promoting the college through the MCC Foundation. Hodel, her husband Don, and Dr. Childe were on stage to present the award to Marcks, which was preceded by an award video that can be viewed on the MCC website at www.Mohave.edu/Kathy-Hodel. 2018 is a banner year for Marcks, who along with the award and his MCC associate degree also earned his bachelor’s degree in elementary education from Northern Arizona University. MCC President Dr. Michael Kearns presents Ronald Marcks with the Kathy Hodel Most Outstanding Student Award commemorative crystal plaque. Marcks moved to Mohave County in 2011, after ten years of service in the Air Force guarding nuclear weapons. MCC President Dr. Michael Kearns, Kathy & Don Hodel, James Childe presenting $10,000 check Ronald Marcks. He used his Veterans Administration benefits to pay for his college education and plans to use the money from the Hodel Award to help pay for his master’s degree in education. While earning that degree he plans to work with the schools in Kingman. ← MCC ConCom is a big success, helps students, brings community together!